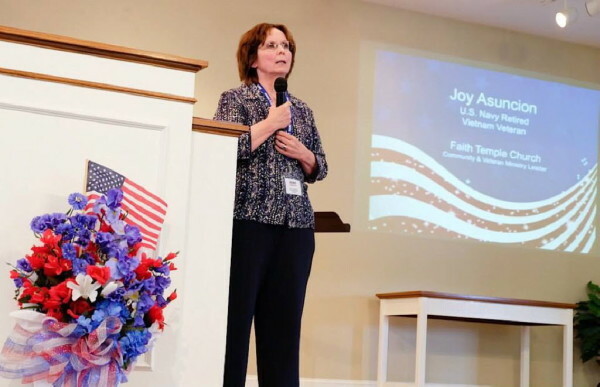 Joy Asuncion, a retired Navy veteran who said volunteering is her passion, was part of a special Veteran's Day service this year at Faith Temple Church in Belfast. BELFAST, Maine — Joy Asuncion of Belfast joined the U.S. Navy as soon as she graduated from high school and spent 20 years serving her country. That desire to serve did not diminish after her retirement from the Navy in 1994, she said recently. Since then, she has seized every opportunity she could to help people, especially veterans and people serving in the military. After leaving her last duty station at Pearl Harbor, Asuncion came home to Belfast and began working at MBNA. She now works for Bank of America, where she is a vice president and corporate recruiter with the company’s human resources department. But Asuncion spends her free hours in different ways. She is a Maine Troop Greeter, who travels to Bangor International Airport at least two to three times a month to welcome troops home or “let them know we’ll be there when they get back,” she said. She also is on the board of directors for the Maine Honor Flight program, which aims to ensure all World War II veterans and terminally ill veterans have the chance to visit the memorials of their respective branches in Washington, D.C. In October, she went as a guardian on a trip with 40 World War II veterans from Maine. She also volunteers through her workplace, where she is a part of the employee’s military support and assistance group. Veterans who work at Bank of America or employees with children or grandchildren serving in the military work together to support families of those who are overseas or on active duty. “It’s all about connecting with the community,” Asuncion said. What she does outside office hours has not gone unnoticed by her Bank of America co-workers. But Asuncion said volunteering has been a labor of love that doesn’t really feel like labor at all.